Serious discussion about the dangers of man-made climate change is finally taking place in public. On July 10th 2017 New York Magazine published a realistic – and thus “doomsday” – article on climate change by David Wallace-Wells. Thanks to internet and social media the article was read by millions of people resulting in informed critics taking the author to task in a constructive and not dismissive manner. I believe critics are being constructive because they share the same motive as Wallace-Wells, which is to alert the public so that realistic action is taken to prevent tragedy beyond imagination. This is music to my ears because over decades I have stated that global desertification and climate change pose greater danger than all wars ever fought. Climate change should have been placed on a war-footing, decades ago. The main criticisms I have seen to date are “Doomsday Scenarios Are as Harmful as Climate Change Denial” By Michael E. Mann, Susan Joy Hassol and Tom Toles (Washington Post) and “Climate Doomsday Essay ‘Is Exactly What We Don’t Need’” By James Wilt. (DeSmog Canada) with a more nuanced criticism “Why Being Fearful Can Spark Climate Action” By Margaret Klein Salamon founder of Climate Mobilization. My experience supports the critics. Thirty-five years ago, the U.S. Government (USDA) engaged me over a two-year period, to put some 2,000 scientists and others through a week of training in the use of the holistic framework for management in complex situations (Holistic Management). This large sample of professional people and experts came from all U.S. Federal land management agencies, World Bank, USAID, and faculty members from U.S. agricultural universities. During that training, I had all groups analyze their own policies in a manner not previously possible before development of the holistic framework. Their findings were expressed unanimously by one group who stated “We now recognize that unsound resource management is universal in the United States.” Some groups I encouraged to analyze global climate change holistically. The result lacked detail to which Wallace-Wells now has access, but the result was the same – the clear end of civilization as we know it, together with many higher forms of life if we did not act with urgency. When doing this I observed the reactions of participants. They were exactly as described by those criticizing Wallace-Wells because he laid out the dangers without offering simultaneous hope. Summing up the reaction I observed, it was “If it is that bad, then let’s just carry on the party and go out with a bang.” Observing that response in highly educated people I refused to ever analyze climate change again and I have over these last 35 years simply struggled to get the message of hope to the public. Something I was finally able to do meaningfully thanks to my TED Talk on the desertification aspect of the problem in 2013. Because that talk offered more hope than anything anyone of us has ever imagined it went viral. What hope do the critics offer? Unfortunately, like Wallace-Wells himself, his critics offer little hope amongst their suggested solutions for one reason – none of their “solutions” addresses the cause of global desertification or climate change. Simple commonsense dictates that if we deal with the symptom (desertification or climate change) and not the cause we will fail. Period. No science overrides such a basic principle. Do not get me wrong, the situation is too serious for misunderstanding. The critics suggest a number of actions that are sensible, wise, supported by good science and by much evidence – such as the compilation of 100 “top solutions to climate change” by Paul Hawken in the recently published Project Drawdown said to be the most comprehensive plan ever proposed to reverse global warming, or the work of the Yale Program on climate change communication, and of course we are aware of the latest film by Al Gore, offering great hope that alternative ways of making and storing electricity will soon replace fossil fuels. Further sensible ideas are included as ten (of 11) finalists in the Virgin Earth Challenge. And Salamon listed six far-reaching actions in broad outline. I am not going to analyze each suggested solution, as we could do using the holistic framework, because none pass the first essential smell test. All address the symptom (climate change) while none address the cause of either global desertification or climate change. One of the first fundamentals in Holistic Management is to ensure an action we propose to deal with any problem, deals the cause of the problem and not simply a symptom. While many of the suggested hopeful solutions are likely to contribute greatly to any final solution, none will do so unless the cause is simultaneously addressed. This leaves us back with Wallace-Wells (and all the climate scientists whose work informed him) because none of the suggested solutions addresses the root cause of climate change. This is one of the, I believe, unarguable principles I rest my case on – that addressing a symptom, helpful as it can be in alleviating pain or suffering, does not solve problems. What then is the root cause of man-made climate change? So, because atmospheric pollutants stem from coal, oil and livestock they are logically the main cause of climate change goes the reasoning. Coal, oil and livestock are guilty by accusation no need for any trial! Just as commonsense informs us that addressing a symptom does not solve a problem, let me once more revert to commonsense. I ask that you think for yourself because the fate of humanity hangs in the balance. Coal, oil and livestock are resources. Resources can never ever be the cause of a problem. For centuries to come, coal and oil, with their large carbon molecules, will be needed to produce many products. And livestock will be needed to feed and clothe people for centuries to come (and to address climate change as I will explain). These resources, like all resources, cannot possibly be the cause of any problem. It is simply inconceivable that any resource can be the cause of a problem. It is management that chooses to call fossil resources “fossil fuels” to be burnt at alarming rate. It is management of livestock by ranchers, farmers and pastoralists that led to global desertification over centuries and still does, and it is management that places hundreds of millions of animals into meat-production factories, force-feeding cattle and pigs grain they did not evolve to eat (they do not have beaks), causing human health issues, economic and environmental damage, desertification and climate change. Management over centuries and now including policies of governments, environmental and international organizations, is the single cause of climate change and not any resource or act of nature. 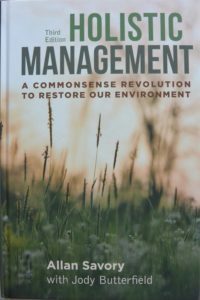 Who in the world can dispute the fact that management is the single cause of climate change? Certainly, no climate scientist can dispute it is management causing climate change. But who in the world is acknowledging management is the cause, or offering any hope by understanding how present (reductionist) management is causing climate change, or how Holistic Management, using all the same science and knowledge, can address the cause of both global desertification and climate change? Because I have explained this so often over decades, as well as in the textbook “Holistic Management: A Commonsense Revolution to Restore Our Environment,” (3rd edition 2016) and in my blogs and through the Savory Institute web site and materials, and because thousands of people on six continents are already practicing Holistic Management to varying degrees, including the first U.S. university to develop a Holistic Management hub, I will not do so again here. All management (which includes policy) is, and always has been, reductionist. This is because even the most sophisticated integrated teams of scientists fully aware that management actions, or policies, will have social, economic and environmental consequences reduce that web of complexity to a simple reason, or context, for management actions. The reason, or context, for our actions routinely becomes such things as to meet a need, desire or deal with a problem. Without exception, the hopeful measures suggested by Wallace-Wells critics reduce the mind-boggling social, cultural, environmental and economic complexity to the problem (climate change) as the context for the all proposed solutions. When the context for actions is too simplistic for the unavoidable web of complexity we experience frequent policy failures and unintended consequences from our actions. So common and routine is this that economist refer to the “Law of Unintended Consequences”. It was this simple point that led to that large sample of scientists working with me in the early 1980s to conclude that every US policy they analyzed would lead to failure and unintended consequences. In the case of desertification and climate change, there is a further insurmountable problem with reductionist management that I need to explain. Use technology in some form. Rest the environment (leave it to nature or conservation). No other possibility exists within mainstream reductionist management and not a single climate (or any other) expert has even suggested any other tool than technology, fire or resting the environment, to manipulate or manage our massively malfunctioning global environment. Why does Holistic Management offer more hope than anything currently known? In summary, it offers real and lasting hope for two reasons. First it addresses the cause of both global desertification and climate change by recognizing these are symptoms of centuries of reductionist management. And this we can correct by ensuring management, including policy development, is holistic (where one single holistic context linking people’s deepest needs to their life-supporting environment and behaviour, becomes the context for all actions while we meet needs, desires or solve problems). And secondly using the holistic framework people recognize the need to include using livestock as a tool with the Holistic Planned Grazing process (or better when developed), without which it is impossible to address global desertification and thus climate change. This latter point I have explained in my TED Talk and many writings and talks over five decades during which time no scientist has indicated where either my logic or science is flawed. Some academics have repeatedly shot the messenger, but none the message. Frankly the expert view (that I here repeat) of climate scientists relayed by Wallace-Wells in dismissing livestock “It takes 16 calories of grain to produce just a single calorie of hamburger meat, butchered from a cow that spent its life polluting the climate with methane farts” amounts to almost criminal stupidity in light of the dangers facing humanity. Wallace-Wells is not to blame because this is a widespread societal view supported by most institutions – government, environmental and international. Such widespread ignorance backed as it is by literally hundreds of celebrities like Leonardo DiCaprio reaching millions of their fans, ensures there will never be any solution and the inevitable fulfillment of the worst predictions for humanity. What is essential to address climate change, and where does Holistic Management fit? Stopping atmospheric pollution – excess carbon dioxide, methane, nitrous oxide and black carbon stemming from burning fossil resources. (Roughly 50% of the annual pollutants). Stopping atmospheric pollution of the same main pollutants from agricultural soil destruction and desertification, as well as from burning of vegetation. (Roughly 50% of the annual pollutants). Removing excess atmospheric pollutants and storing them in soil mainly by regenerating the world’s dying agricultural soils, reversing global desertification and regenerating the life in the oceans, including the most productive continental shelves. The first of these is entirely a technical issue capable of solution only by developing mass benign forms of energy using technology. This aspect does not directly involve the biological sciences, nor does it involve complexity (because we are using technology to make a form of useable energy ie. electricity from sun or wind). Everything humans “make” involves some use of technology and expertise and in Systems Science is defined as a complicated hard system (by definition not self-organizing or complex). Vast sums of money are being invested and thousands of creative minds are working on the alternative energy issue. In addition, millions of dollars are being invested by capable proponents in public education through documentaries, articles, etc. as Al Gore is doing. If we are successful within the next few years and we stop all burning of fossil resources, clearly global desertification, agricultural soil destruction, burning of vegetation and destruction of life on ocean shelves will ensure continued climate change. And thus the second two aspects of climate change become the most critical. Issues 2 and 3 – stopping agriculture’s contribution to climate change and desertification, while removing and storing excess pollutants – are our Achilles Heel and the most difficult aspects of climate change. These aspects involve the biological and social sciences, and they involve complexity. Complex natural systems and complex soft systems (human organizations) both self-organizing and thus complex by definition. These complex aspects of climate change are entirely in the realm of management not lending themselves to technological quick fixes despite our beliefs. With agriculture being a greater player than even fossil fuels, remember that agriculture is not simply crop production. It is the production of food and fibre from the world’s land and waters. So almost the entire globe is engaged in agriculture today with crop production taking place on about 20% of the Earth’s land area. Crops, forestry, fisheries, wildlife production are all agriculture contributing possibly more to climate change than fossil resources. Mainstream reductionist agriculture producing every year, as it does, more than 75 billion tons of dead eroding soil (more than twenty times as much as the food we need to feed every human alive today) is the most destructive extractive industry ever. More destructive than any mining of coal and oil, destructive as those are. Bothe aspects 2 and 3 of climate change involve agriculture in its broadest sense and an inescapable web of social/cultural, economic and environmental complexity. Where these two vital aspects of climate change are simply impossible to address with the same reductionist management that caused the problem, they are capable of solution using the holistic framework (or better when developed). If Holistic Management has been around for decades why are people only hearing about it now? Because Holistic Management involves recognizing that livestock in vastly increased numbers are essential to reversing desertification and regenerating the world’s dying soils, and such scientific insight is counter-intuitive flying in the face of centuries of blaming livestock and deep beliefs of universities, environmental, government and international organizations, it has been vigorously ridiculed and opposed now for over five decades of shooting the messenger. Such behaviour is best described by Thomas Kuhn in “The Structure of Scientific Revolution”. It is normal behavior when new counter-intuitive (paradigm-shifting) scientific insights are involved and has not changed since Galileo. When training thousands of scientists in the use of the holistic framework at the request of the USDA in the early 1980s as I did, all of them were urged to identify any flaws in either the logic or the science. Some identified minor communication flaws that improved the process, but no major flaw in either the science of logic was identified. That is the situation to this day as I write over 30 years later. As has happened throughout history, when any new counter-intuitive scientific insight emerges it is always opposed by experts in the current paradigm and by institutions that reflect as they do the public view. Thus, all organizations including cattlemen’s, environmental, universities and government and international have ignored or opposed Holistic Management without study or investigation. A handful of Range Science academics in particular have published many peer-reviewed papers critical of Holistic Management without ever studying or researching it, while citing one another’s papers repeatedly as evidence. Only since my TED Talk going viral, making sense to people and offering great hope has public opinion toward livestock shifted slightly and the first organizations begun to investigate and collaborate with the Savory Institute’s global network of Holistic Management hubs now on six continents, as people respond to hope. Where now do we sit globally? Wallace-Wells, and New York Magazine, have done an enormous service publishing a realistic, well-researched article on the extreme dangers facing humanity. Critics, while not seriously challenging his dire warning have made clear the need for society to have hope for any timely and serious action to take place. There can never be one silver bullet, but the holistic framework provides a simply way to help determine which of the proposals in Project Drawdown, and other suggestions by the critics, are appropriate, or not appropriate. And it helps avoid unintended consequences. Consequences that are almost certain from geo-engineering suggestions such as spraying our atmosphere with sulfate aerosols, or spreading iron filings in the oceans as scientists become desperate. A desperation easy to understand when they have no other tool even in their imaginations other than technology to solve what is a management problem. Even sensible suggestions, like using technology with fire to make biochar for example, will fail under reductionist management (remember the basic principle that any measure must include addressing the cause, not just the symptom). However, such measures could play a significant role, where appropriate, in ultimate success when management is holistic addressing the cause of climate change. And this scenario will apply with many of the proposed more sensible solutions such as in Project Drawdown. However, because of global desertification, agriculture annually destroying more soil than food produced, burning billions of acres of vegetation and decimating ocean life, climate change will continue. A handful of farmers aware of this are leading the way in beginning to manage holistically in what is best called regenerative agriculture (a term first coined by Bob Rodale) – regenerating agricultural soils and soil life, communities and economies. The massive mainstream juggernaut of reductionist agriculture continues to endanger humanity even more than mismanaged coal and oil. Far from feeding the world, as claimed by corporate and university-led agriculture, it is bleeding the world. Holistically managed regenerative agriculture vs reductionist industrial agriculture supported as it is by governments, universities, international agencies and well-meaning people like Bill Gates, is a truly David and Goliath confrontation. And David must win if there is to be any hope at all. But David can only win if supported by millions of ordinary people more concerned for their families than for corporate shareholders becoming vocal and active. Viewing this global scene, as I have been doing for many years, I will stake my life on it that humanity’s best hope lies in one simple idea that no scientist can sensibly argue against – that management in this 21st century should be holistic and no longer reductionist. And Holistic Management of course includes recognizing that only livestock with Holistic Planned Grazing (or better process when developed) can address global desertification, annual burning of billions of hectares of grasslands and savannas, and regenerate the world’s dying soils and soil life essential to addressing climate change. Although the public constantly call for leadership from our political and other institutions, history teaches us that leadership with any major paradigm shift can only come from ordinary people to whom any new direction makes sense. I cannot find a single case in history where any institution ever changed ahead of a significant shift in public opinion when new insights were involved – such as is involved in management needing to be holistic and livestock being essential to the future of humanity. Reductionist management, without using livestock managed on the land in a way that addresses global desertification and climate change, will inevitably lead to the doomsday predictions of Wallace-Wells. Billions of people dead and hundreds of cities destroyed and worse in the relatively near future no matter how many hopeful measures we might take. Holistic Management to address the web of inescapable social, cultural, economic and environmental complexity inherent in any management, together with Holistic Planned Grazing process addresses the cause of global desertification and climate change and offers that hope future generations deserve – a hope so great that all can put a shoulder to the wheel in our hour of need. I have long said; most people are good and doing their best. And the moment that management, including policy development, is holistic (using the holistic framework) we will see the human spirit fly as never before. Just as we had a person on the moon within 70 years once the Wright Brothers gave us the principles of flight, we can far surpass that as soon as we release the creativity of young people desiring and deserving a future by addressing the cause of climate change that is 100% management. I have over many years of training thousands of people, from illiterate pastoralists to professors, never known ignorance block learning and Holistic Management is easy to learn. The only things I have found block learning (and I include myself) are what we know already and our egos. Thankfully young people whose futures are at stake are open to rapid learning and have not yet pinned their self-esteem to their expertise. I believe that with the future of humanity at stake and climate change on a war-footing, there is no place for any scientist’s or institution’s ego, including my own. What I hope for humanity’s sake is that this my response to Wallace-Wells will be thoroughly investigated starting with good investigative reporting by independent journalists, major papers and magazines. By Congressional enquiry or any other means as the seriousness of the situation demands. If such investigation shows that my logic or science is flawed and there is a more hopeful path I will be the first to embrace that as I would hope would all of us facing the grave dangers we do. Without a better informed public, commonsense and good science there is little hope, but given these younger generations can face the future with great hope.